I’ve heard the controls in Batman: Arkham Asylum described as “solid”. A lot of people seem to have independently hit on this word to describe the feel of the controls, but what does it mean? 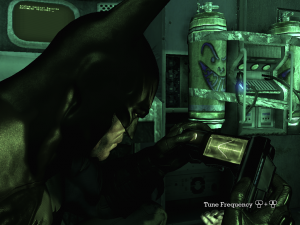 I think it’s mostly a matter of the feedback: any time you press a button to perform an action, the game plays a satisfying sound cue, and often shifts the camera, the better to show Batman very decisively acting as instructed. Also contributing to the “solid” feel is that your actions pretty much always succeed. When you fail, it’s because you did something foolish, like charge at someone with a gun rather than sneak up on him or take cover and throw batarangs at him. You don’t fail because you attempted the right thing but got the timing slightly wrong and didn’t execute it correctly. After all, you’re Batman. Batman executes everything flawlessly. Even in combat, you don’t throw punches and miss. You press that punch button and someone gets punched. With a bone-jarring thud, and sometimes in slow motion. You can fail in combat, but only by making bad decisions, like trying to do a takedown move on one guy when another guy is preparing to hit you. I once said that in some console games “the level of detail in the solution… is on a much coarser scale than the level of detail in the presentation“. The feel I’m trying to describe here has a lot to do with that. On the screen, there’s a lot of messy analog stuff going on with physics, but the exact placement of objects in the world seldom matters much. Anything important happens at the story level, the level of deliberate decisions. A lot of what you do is stuff that could be expressed in a text adventure with no loss of detail, like kicking a grating off the wall or using a gadget to make a sentry move away from his post. There may be an infinity of routes you can take from point A to point B, but all that matters is whether you chose one of the routes that has sufficient cover from observation or attack — and that will be a route that a game designer intended. There’s enough simulation that the game doesn’t just come down to CYOA, but the interactions between game elements are all very planned-out in a way that makes me think of the methodologies recommended by Jesse Schell. Having played the game a bit with both a gamepad and mouse/keyboard control, I find it interesting that the two control schemes are not completely isomorphic. In most games, I’d expect the left mouse button to perform the same function as some particular button on the gamepad, probably the one that performs an attack or whatever the most commonly-executed action is for that game. Here, the left mouse button is indeed the “punch” button, but it’s also the “use gadget” button when you’re in gadget mode. (Being in gadget mode basically means using your analog controls to choose where to aim the gadget.) It makes sense for both of these actions to be on the left mouse button because they’re both your basic “do the thing now” action in their particular contexts. But with an Xbox controller, which doesn’t have a single most privileged button, those two actions are separated: “punch” is the X button, “use gadget” is RT (the right trigger button). It makes sense to put “use gadget” on the right trigger because pressing and holding the left trigger is what puts you into gadget mode in the first place, and the easiest thing to use in combination with a trigger button is the other trigger button. With mouse/keyboard controls, the thing that puts you into gadget mode is holding the right mouse button, which is also the “counterattack/take-down” button if you just click it instead of holding it. Probably the most problematic adaptation, and the clearest illustration of the fact that the game was designed around a gamepad, is the Cryptographic Sequencer. This is a sort of lockpick for the game’s many electronic locks. You operate it by twiddling a couple of knobs to tune a waveform and holding it for a second in its optimum position when you find it. With a gamepad, you do this with the two analog sticks. 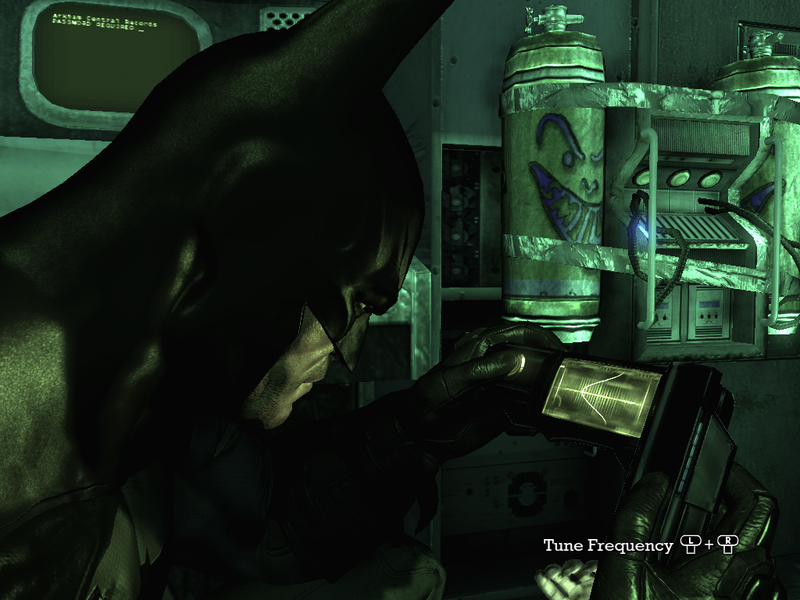 A colleague of mine has praised this as being the one thing in the game that makes you feel the most like you’re Batman: he’s on the screen doing exactly the same thing that the player is doing, manipulating a pair of rotary controls with his thumbs, in unison with your own movements. But with keyboard/mouse, you don’t have an analog control under each thumb; only one hand has an analog control. The designers apparently decided that the feel of controlling each knob with one hand was the important part, and made it so that you control the left knob with the keyboard, using the A and D keys to twiddle it clockwise and counterclockwise, and the right knob with the mouse, using the left and right mouse buttons — yes, not even using the mouse as an analog control, presumably for consistency with the other knob. The result is unintuitive and not at all as solid-feeling as using gamepad.